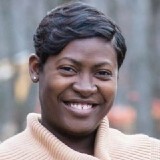 Quantrilla (Quanny) Ard is a faith-based personal and spiritual development writer who lives in the DC Metro area with her husband and three littles. We Struggled Without Afterschool Care in the 80s. Two Million Parents Today May Struggle Again. Moms are tired AF, but they are still Superheroes. If you are a mom, it means your work is never done. Are You a River or a Rock? When you think of your life, are you a river or a rock? Slowly but surely, my mother is disappearing in front of us, and there’s not a damn thing we can do to stop it.